Swimming pool rules and safety tips around swimming pool. Swimming lessons for children are an important part of pool safety. Pool safety rules and regulations should also be known and enforced by every pool operator and manager. Rules should also be followed by swimmers. Proper pool safety supplies, rescue tube, etc... need to be accessible. If you're a pool operator, check with your local agency to get and post an ordinance copy of the official pool rules. Be sure that all of the swimmers and lifeguards become familiar with them. You need the right information and tips before you go swimming to ensure you and your child are protected from accidental drowning or a submersion injury. If you don't have a list of pool rules, then this may come in handy. Pool rules are not put in place to keep you from having a good time. Nobody is on a power trip or to "control" you. On the contrary. They're set in place to keep you and other guests safe. Please follow the pool operator's or lifeguard's instructions. This is a fairly long list of pool safety rules but well worth the read. No one is allowed in the swimming area unless the pool is open and a lifeguard is on duty. Infants/children who are not potty trained must wear baby swim diapers and adults who are incontinent must wear a clean and snug fitting diaper or disposable swim diaper covered by separate rubber/vinyl pants, all of which must fit snugly around the legs and waist. Due to the strenuous nature of swimming, the participant is advised to consult his/her physician concerning fitness to participate. All activities present certain inherent risks and hazards which the participant assumes. All patrons within the pool area must have proper swimming attire. No street shoes or clothing is allowed on deck. The swimming pool and deck must be maintained in a sanitary manner for the protection of bathers. Children under 10 entering the pool must be accompanied by a responsible person 16 years old or older in swimming attire. Children under 6 need to have a responsible person in the water with them and within arms reach. Children and infant swimming lessons should be offered. Food or refreshments may be consumed only at snack bar or other designated areas. All refuse and waste papers must be deposited in designated receptacles. Please recycle. Food is NOT permitted in locker rooms. Picnic baskets are permitted in the grass area of the outdoor pools. No grills, gas or electric cooking devices may be brought into the pool area. Glass containers, alcoholic beverages, drugs and pets are not permitted in the pool area. Service animals are permitted in the pool area. Leave valuables at home. Valuables may not be checked with the cashier or pool staff. The lifeguard is in charge and will enforce any swimming pool rules. Persons under the influence of alcohol or drugs will not be permitted in the pool area or in the surrounding area. No person within the pool grounds shall behave in such a manner as to jeopardize the safety and health of himself/herself and others. Such behavior, including abusive or profane language, shall be grounds for dismissal and is against our swimming pool rules. Loitering will not be permitted on the pool grounds. If a patron with a disability needs special accommodations to use the pool complex, please contact the lifeguard or Pool Manager. Any injury occurring in the pool area must be reported to the pool management immediately. Employees are the only persons allowed in the guard room, filter room, mechanical room, storage room and offices. The use of cameras, video cameras or any device containing camera equipment of any kind violates swimming pool rules and is prohibited in all locker rooms, bathrooms and changing rooms. Obviously these are not all of the swimming pool rules available but will give you a good run-down of the rules of your local swimming pool facility. Pool users must wear swimming suits or swimming trunks upon entry into the pool. Clothing such as cut-offs, gym shorts, and underwear is not permitted as swimwear. Guards have authority to enforce all swimming pool rules. Patrons who repeatedly violate the swimming pool rules may be ejected by the lifeguard or Manager. All patrons must take a cleansing soap shower before entering the deck area. Sun bathers must shower before each entrance into the water in order to rinse off perspiration, lotions, and sunscreens. Any person having a skin disease, sore or inflamed eyes, cold, nasal or ear discharge, communicable disease, or who is wearing any kind of bandage or band-aid will not be permitted in the pool. Any adult or child who is experiencing even a mild case of diarrhea may not use the pool. Running, boisterous or rough play, pushing, dunking, wrestling, splashing, yelling, diving or jumping haphazardly, improper conduct causing undue disturbances in or about the pool area or any acts which would endanger any patron are prohibited. Spitting, spouting of water, blowing nose or urinating in the pool are prohibited. Non-swimmers must remain in shallow water (chest deep or less). Toys, balls, inner tubes, inflated boats, and rafts are not permitted without prior written consent of the pool Manager. Food and drinks are not permitted on the pool decks. Smoking is not permitted anywhere in the indoor pool facilities. At the outdoor pools, smoking is permitted only in designated areas. Single groups shall not monopolize a particular area of the pool and thereby limit its use by or intimidate other patrons. Wearing eyeglasses in the pool is discouraged unless absolutely necessary. Non-breakable lenses and frames are necessary for safety. Gum chewing is not permitted anywhere in the pool facility for health and safety reasons. 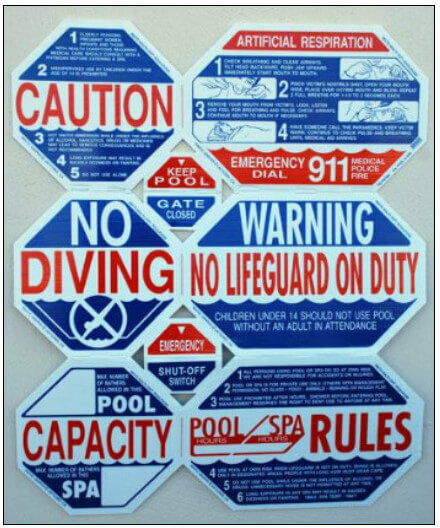 As always check with your local agency for swimming pool rules that apply to your pool facility. If you run a commercial indoor or outdoor pool I would advise you to not allow any cotton T-shirts or shorts. Cotton may plug up the filtration system and pump baskets. Polyester, spandex, Lycra, etc.. are better alternatives. As I always tell the guards at the YMCA, swimming pool rules are not there to keep members from having fun, but to make sure everyone is safe and able to have fun. When people are safe, then there's fun to be had. Who couldn't use that? This is for adult and child swimming pool safety. Go swimming and have fun.